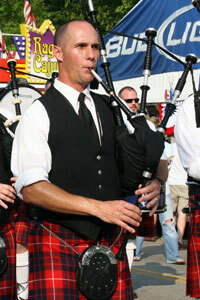 City of Chattanooga Pipe Band has played at Riverbend numerous times throughout its history. weddings, funerals, parties, and other special events. You can hire one piper or the entire band. If you or your organization is interested in showcasing your Scottish heritage, there is no better way than sponsoring Chattanooga Pipes & Drums Pipe Band. Sponsorships can include free concerts, advertising opportunities, and complimentary merchandise. Sponsorships of more than $1,000 per year are eligible for mention and/or advertising on this website. Those who are interested in sponsoring the band at this level may also be able to negotiate for even more great benefits! and the surrounding area at highland games and competitions since 1999. During that time, the band has earned a reputation for professionalism and outstanding musicality. This reputation has helped the band secure some very high profile gigs.